From 20' to 50' high with a strong horizontal branching pattern. Foliage long, oval, scalloped, leathery and dark glossy green. Early blooming with pure white flowers. 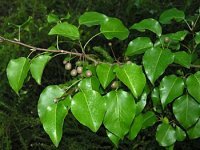 Resistant to fire blight. Excellent fall color. Very ornamental and outstanding tree. Aristocrat (Plant Patent No. 3193) - A pyramidal growth habit forming an open crown. Its form makes it less susceptible to storm damage. Leaves are narrow and green turning deep red in the fall. Flowers are white. It has proven to be more cold hardy than some of the other pear varieties. Bradford - Dense, rounded form. Grows in height from 35' to 40'. Leaves are glossy green. Flowers come early and are white in color (image)​. Cleveland Select - Shape is somewhat cone shaped with good branching. Grows in height from 25' to 30'. 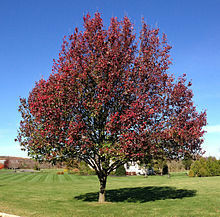 Leaves are green with outstanding fall color of purple and reddish-orange. Red Spire (Plant Patent No. 3815) - Pyramidal tree which is very hardy. Grows in height from 30' to 35' with a 20' spread. 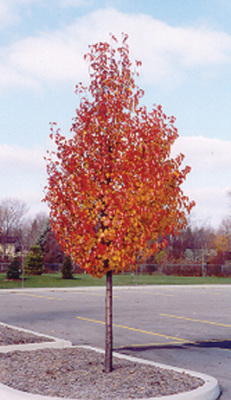 Leaves are glossy green, with a yellow to red fall color. Flowers are large and white ​(image).